Though it might sound odd to non-Japanese readers, THE LADY OF MUSASHINO reminds me of Hayao Miyazaki’s 1988 animated film, MY NEIGHBOR, TOTORO. This animation is notable for its charming atmosphere, its tranquility of the countryside and, most of all, the group of fascinating characters, including the mysterious troll of the neighborhood, TOTORO. On its surface, MY NEIGHBOR, TOTORO would seem to have little in common with the tormented sexual relationships in THE LADY OF MUSASHINO. The fictional location of Miyazaki’s work is said to be the composite of the landscapes of various locations in Japan, such as the rice fields in Akita prefecture, the Kanda River in the 1950’s, or Sakuragaoka in Tokyo. But the setting of TOTORO is most reminiscent of the Sayama Hills section of Musashino Saitama. This hill is located near the house in which Miyazaki lived during the production of TOTORO. Today, that part of Sayama Hills is now called “Totoro’s Forest“, and is owned by the public not-for-profit organization founded by Miyazaki. Miyazaki once said that the story of TOTORO takes place in 1953. Therefore, THE LADY OF MUSASHINO, filmed in 1951, and TOTORO share the same landscape of Musashino during the early 1950’s. Contrary to Mr. Klady’s comments, TOTORO was not aimed at an international audience at the time of its production. It was not even a main feature at the time of its initial release. It was tacked to THE GRAVE OF FIREFLIES to create a double feature. To Japanese minds, the atmosphere and landscape of TOTORO is more than interesting. It is the landscape that touches the primal part of our psyche. It evokes something warm, something we once had and lost, the air we used to breathe but not anymore, the sun-drenched afternoons we cherished and the community we think we used to have. That’s why so many people are fascinated by the film, and search for its counterpart in reality. That’s why they created “Totoro’s forest”. The area was purchased by public donations (400 million yen were donated so far). The Ghibli’s Museum in Mitaka is so popular that you have to buy its ticket many weeks in advance, and a reconstruction of Satsuki and Mei’s house was a featured attraction at the 2005 Nagoya Expo. These attractions and projects are widely popular among general public, including not only children but grownups, also. To us, the world of TOTORO is not a “nowhere land more confused than fascinating”. It is something familiar, but no longer with us. And Miyazaki hoped to share this sense of wonder with us. Since there are many articles, reviews and analysis about TOTORO on the internet, and in literature, a summary isn’t necessary here. 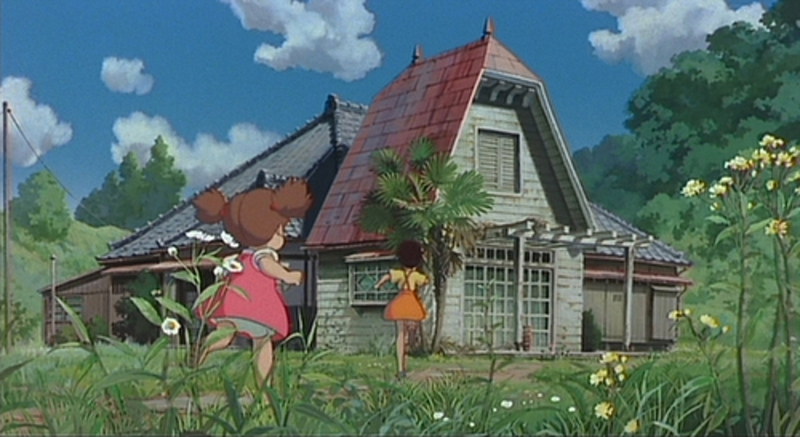 The film opens with the scene in which two sisters, Satsuki and Mei, move with their father to the quiet farming village. The house they move into surprisingly resembles the Ohno house in THE LADY OF MUSASHINO. The screen captures above show this resemblance between the two houses in the films. The overall design is more than similar: the tall, two-story house of western style design, the steep roof with beveled cutaways on both ends, and the front patio with a white pergola over it. The house in TOTORO has a traditional Japanese wing attached to the back. The Japanese-style wing seems to function as residential area—the kitchen, bathroom and living room—while the “Alpine-style” section is essentially the father’s study. Back in 50’s, any kind of western-style house was pretty rare in suburbs, more so in farming villages in rural areas. It is quite astonishing to find the architectural production design so similar in two separate films, more than 30 years apart from each other. It is possible that the artist of TOTORO, Kazuo Oga, or Hayao Miyazaki himself, borrowed the design of the house from Mizoguchi’s film. In one of the interviews, they said that there was one particular house in Asagaya, Tokyo that inspired them to design the house in the film. I don’t know about the origin of Mizoguchi’s film production design. But then, we wonder, what was so special about these houses? What made these artists to place these rather rare western style house in the landscape of Musashino? In THE LADY OF MUSASHINO, the Ohno house is presented in stark contrast to the Akiyama estate. The Akiyamas are a family of long tradition, respected by the rural community around them. They live with dignity and pride openly visible to anyone and it shows in the house in which they live. In contrast, the Ohnos are practically nouveau riche, running a successful manufacturing business. They are much more vain, and, in a sense, vulgar. For better or worse, they represent the modern Japanese life style. If we interpret the architecture in TOTORO with these things in mind, the amalgamation of Japanese traditional style with western design suggests it is meant to be the boundary between the ancient and the modern. The family live in a rural Japanese manner (in the Japanese style wing of their house), while their father works as an academic researcher (in the western style wing). Their father, an intellectual who works for the university, is not directly involved in capitalistic activities, but it is nevertheless another form of modern life. The most notable thing is that, in both cases, these houses are not imposing upon, or threatening, their environment. Rather, the houses quietly blend into the landscape of Musashino. This is fundamentally different from the brutal invasion of the postwar economic boom as evidenced in the last shot of THE LADY OF MUSASHINO. The invasion does not have any sympathy, respect or affinity for the rural landscape. It simply destroys the world of TOTORO and Tustomu’s daydream. The character, Totoro, is a sort of troll living in another dimension of the neighborhood. In THE LADY OF MUSASHINO, the presence of dead souls, ancestors and the supernatural, govern the lives of the Akiyama family. Understanding this presence of supernatural entities in our habitat, in the context of our relationship between human and nature, is essential. You may call it paganism, animism, or primitive religion. The truth is, Japanese animism has always taken on many forms in our beliefs and superstitions, and this supernatural presence has been a part of our culture along with traditional Buddhism and Shintoism for many centuries. It is encoded into our cultural DNA, so to speak. This is particularly true of our fascination with Musashino. Musashino has been the backyard of slowly evolving civilization for centuries, always being a boundary between Nature and Civilization. Generation after generation, our ancestors lived in Musashino, immersed in the power of nature, and gazing upon the presence of the supernatural with awe and fear. To them, that presence, that “something unseen to the eyes of the unclean”, controlled their lives, protected them and destroyed them. In this regard, both films observe nature as a quiet but uncompromisingly powerful entity, inhabited by supernatural beings.